If you want an audience, then you’ve got to have content for them to consume. That’s why I took two months to research my niche and develop an editorial calendar. It’s about writing with intention. Each blog post has a purpose. At this early stage, for me that purpose is to grow the Heartwood Art YouTube channel as fast as possible. That means creating videos as fast as possible and embedding them on my site. Of course, in the videos, I’m telling folks to subscribe to the channel. But more importantly, I’m telling them to come to the site for more. The whole point of the videos, and any other place I promote, is to ultimately drive traffic directly to the site. After all, the site is where the money makers will be, eventually. A site without ads is just cleaner looking and more enjoyable for the visitor. Even the ad agencies will admit to that. And while I’m growing my audience a lack of ads is actually a good thing. I may not make money this way, but a clean site gives me the best opportunity to create a loyal fan base. They have such an enjoyable experience that they keep coming back for more. And they tell their friends to come too via sharing my posts. Creating raving fans is THE best way to grow and get known. There is no substitute for word-of-mouth advertising. By the time I have enough audience to warrant ads, I’ll also have an established audience that will forgive the intrusion because they are happy with the content they have been enjoying. There isn’t a whole lot of evergreen content on BlogAid. In fact, most of my post content is so transitory that it is dead in less than a year. And, I have to admit that I haven’t done a good job of revamping the potential evergreen content to extend its life simply because I’m so busy keeping up with new. That is not going to be the case with my woodworking site!!!! The beginner and DIY shop projects I’m doing right off the bat will be good forever. Folks are always going to want to know how to build a workbench, or how to use a mitre saw. So, I have to get into some new habits with promotion. Not only do I have to create an editorial calendar for the blog. I now have to create a promotional calendar and recycle and repurpose that content. READ: My editorial calendar post for 15 ways I plan to repurpose my content, and a link to the woman who taught me how. I could never make sense of how to use Instagram for BlogAid. But it makes perfect sense for @HeartwoodArt because I’m having so much fun that I want to share it. And I’m learning all about the power of hashtags there too. I’m finally starting to see ways to use IG for BlogAid now too. Now, I don’t see IG as a big driver of traffic back to my site. But I do see it as gaining audience and staying in direct touch with my niche. And that has its purposes too. And, I’m starting to enjoy being more social again, instead of just reporting the news. Back when I started Heartwood Art, Twitter was just catching on, and Facebook was still new. And I met so many wonderful folks on those platforms. IG is feeling that same way now and I’m having a blast. I’m also looking forward to experimenting with more short video on several platforms. And while I can have fun with BlogAid, the nature of the topics I cover just aren’t appropriate for silliness. I am so thankful I have an outlet for my wit and to share some silly grins more often now too. And I am beyond grateful to follow more of my peeps and share in them having fun as well. It’s all spilling over into BlogAid, and I look forward to trying new things with it as well. The point is – it’s important to stay open to new things and try new platforms. Emerging platforms is one of the best ways to gain new audience. New platforms have new energy and are just plain more fun than those that have an established “way” of doing on them. While there is no way to have enough time to be everywhere online and keep too many platforms going at once, I do believe it’s just as important for a platform to be fun for the creator as it is for the viewers. That energy comes across in what I post. I’ve had more folks comment on my big smiles from my wood posts, and how it’s clear that I’m in my happy place, as any other type of comment. Only my overalls have gotten more engagement. READ: How to Make Your Brand Instantly Recognizable for more on my bibs. Yep, if you know how to promote or someone helps do that for you. Remember, Van Gogh would have never sold a painting had it not been for the support of his brother. It’s not enough anymore to just love what you’re doing. And here’s how I know that. I started the Heartwood Art site just to share my carvings with families and friends. That garnered features in magazines and a book deal. READ: more about that journey. I never made a business out of it for a variety of reasons you’ll see in the post above. But, the biggest loss was my audience because I quit feeding them. And they left. Now I’m having to start over from scratch. And now it’s not so easy because the niche is a LOT more saturated. However, I know if I keep creating high quality and entertaining content, my audience will grow. I just have to work harder to promote it in more places now. And I have to keep focusing on my audience, and my traffic, even when I grow it to the point of monetizing the site. 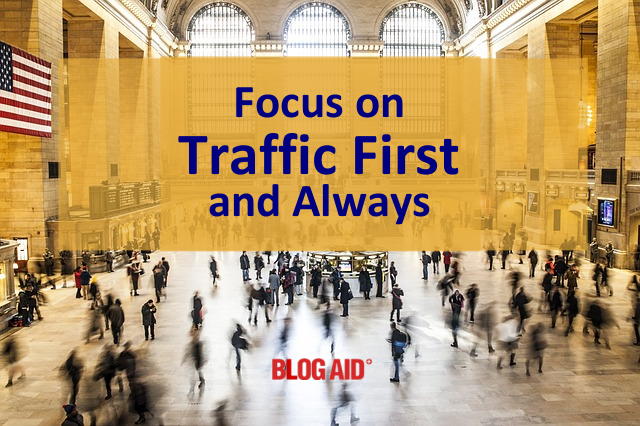 How is Your Traffic Focus Going? Did you start a blog for fun and then get serious about monetizing? Or did you start with making money in mind right off the bat? How did you grow your audience? What did you do to bring that traffic back to your site? This is so true! Most new bloggers are so eager to start making money from their blogs that they quickly plaster them with ads before they’ve taken the time to build up a body of content and a decent level of traffic. As a result the few visitors that do find their way onto the blog see primarily a bunch of ads and they leave, never to return. I’ve built several successful blogs over the years, and it generally takes several month of steady content creation to grow a blog to where it’s ready for ads. However, that being said, it’s never too early to include a few well-placed in-context affiliate text links. For example, if you have a great blog post explaining how to use a table saw to create one of your craft items the readers might appreciate a link to your favorite general purpose saw blade on Amazon. And that link can definitely be an affiliate link. I’ve been using affiliate links on my blogs (and Amazon in particular) since 2003 and my experience has proven that as well-placed in-context affiliate text link will out-perform a display ad several times over. I appreciate your insight, Rick. My concern is the new 90 day rule with Amazon and I see new bloggers with low traffic asking folks to do a link swap just to stay alive in the program. My understanding is that is against Amazon’s TOS and they will eventually figure it out if the sales keep coming from the same folks and such. So, seems prudent to get the steady traffic first to ensure you meet that minimum. And, I REALLY want to get switched over to Gute before placing any links, as I believe there will be a better way to do it with that and I want to do them all at once. FYI, I did email you about an Amazon chat, but maybe the email you use for comments didn’t let it go through or such. Please contact me via the site. I actually started my first blog back in 2007 but stopped blogging for a few years. Life got crazy, I felt overwhelmed and I don’t know what else happened now looking back to be honest. Rough patch I guess. I had gone back to work out of the house too. Fast forward to today and I decided to finally start taking them more seriously then I ever have. I had some traffic years ago and yes you have to start all over when you leave the scene for a while. I have 2 blogs that I want to build up and one that I am focusing on more then the other first. I switched from Blogger to WordPress and so there was a lot of work to do. But there are also cool new plugins to work with! One of my blogs has affiliate stuff on it and one has some Google Adsense. I try not to overload it and I notice now that the Auto Ads place ads in more places then I normally would. But I will let Google do it’s thing for now and see how it works out. Thanks for sharing your journey with it Dawn. I can’t imagine how much work there was switching to WordPress!! I’m seriously considering Adsense to start out with too, plus Amazon. But I know that sponsored ads will do well and hoping to get enough audience to attract those peeps again too. They used to contact me for the coolest carving related products. Hoping for more DIY builder brands this time around.